Welcome to Northern Arizona University Educational Programming! NAU's Elementary Spanish programs are among the leading choice for language education in the classroom and the home. These innovative and interactive courses have helped a generation of children learn Spanish. Please, watch the below preview to see the excellent quality and educational effectiveness of this series. 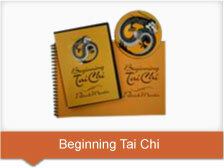 Beginning Tai Chi with Patrick Martin is a six-part video lesson (now all 6 lessons are available on one DVD!) studying the fundamental movements and philosophies of the ancient "soft fist" martial art, Tai Chi Chuan. Instructed by long-time martial artist, Patrick Martin, who has studied with the prominent Chinese tai chi Master Chen Zhenglei. With his unique, personal, and gentle instruction, Patrick will guide you through the age-old practice of stress relief and mind/body balancing using the basics of tai chi. Go to the product page.